On March 26 and 27 some 800 community advocates from 30 states will participate in the third annual Vietnam Advocacy Day. Through meetings to be held primarily on Capitol Hill, participants will engage members of Congress in specific actions to ensure that religious freedom, workers’ rights, the rights of indigenous peoples, and the unconditional release of all Vietnamese prisoners of conscience are included in the US government’s discussion with Vietnam about the Trans-Pacific Partnership (TPP). With Burma initiating a number of significant political reforms, the Vietnamese government now stands out as the worst violator of human rights and worst enemy of democracy in Southeast Asia. Vietnam has the most prisoners of conscience – numbering at least 300 -- among all countries in the region. On the first day, delegations of Vietnamese Americans coming from different cities and states will meet with their respective members of Congress. In the afternoon, the Tom Lantos Human Rights Commission will hold a hearing on the Persecution of Religious and Indigenous Communities in Vietnam (for more information: http://tlhrc.house.gov/hearing_notice.asp?id=1257). In the morning of the second day, a large number of members of Congress will address participants at a plenary session held at the Capitol Visitors Center Auditorium: Senators Ben Cardin, John Cornyn and David Vitter; and Congressmen Bill Cassidy, Zoe Lofgren, Ted Poe, Christopher Smith, Ed Royce, Bob Woodall, Ileana Ros-Lehtinen and Cathy McMorris Rodgers among others. Congressman Gerry Connolly will join Vietnamese American elected officials at the press conference at 11:30am. In the afternoon, the first annual Vietnam Civil Society Conference will feature six panels with a total of 18 panelists including Vietnamese human rights defenders in Vietnam and overseas, international human rights experts and researchers, and members of Congress including Congressmen Christopher Smith, Frank Wolf and Alan Lowenthal. “We are confident that the event will continue to empower and inspire many more Vietnamese Americans to become civically engaged and politically active," said Dr. Nguyen Dinh Thang, BPSOS’s CEO and President. A press corps of some 30 reporters will cover all aspects of the two-day event. Through social media and live streaming technologies, people in Vietnam and across the globe will be able to watch most activities throughout the event and even participate in the Vietnam Civil Society Conference. This advocacy movement started with the National Summit of Vietnamese American Leaders convened by Boat People SOS (BPSOS) in 2011. The first Vietnam Advocacy Day brought 500 advocates to the National Capital in 2012. In the second year, the number grew to 800. This year, scores of advocates from Canada and Europe will participate in the event to provide support and with the intention to replicate it to their respective countries. 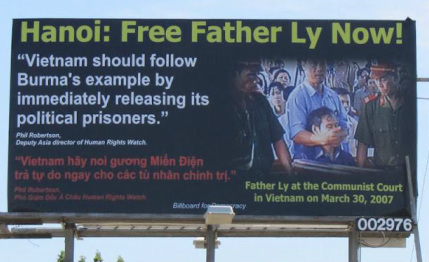 Billboard erected in San Jose, California calls for the release of Father Nguyen Van Ly.